Our friends at the University of Maryland’s Rehab & Ortho Institute are hosting an Amputee Coalition Certified Peer Visitor Training Course May 4, 2019. What is a Certified Peer Visitor, or CPV, you ask? The Amputee Coalition started this program to allow people with limb loss or limb difference the ability to help and mentor one another in a way that is unique. The CPVs are living with limb loss or limb differences themselves, so they are able to connect in a way that few others can. There are currently over 300 trained volunteers across the United States! These trained peer visitors are matched on a case by case basis to those requesting visits. If you are interested in becoming a CPV, check out the Amputee Coalition’s website and submit your application. Please note, you must submit your application by April 20, 2019 so the Amputee Coalition has time to process it before the course. Your application must be submitted and approved before you register for the course. If you’d like to volunteer as a CPV in the University of Maryland’s Rehab & Ortho facilities, contact Kim Cardosa, PT at (410) 448-6731 or email her at Kcardosa@umm.edu or Megan Flanders, CTRS at (410) 448-6303 or email her at Megan.Flanders@umm.edu after you submit your application online and they will take care of your $40 registration fee. You do not have volunteer at the University of Maryland’s Rehab & Ortho facilities to attend the training on May 4. If you’d like to set up a visit with a CPV, start by making a request online by clicking here or calling the Amputee Coalition at 1-888-267-5669. After another banner year of Amputee Walking School, we couldn’t wait to confirm dates for 2019! Keep watching our website and Facebook page for more details as they are available. See you next year! The Amputee Coalition’s Paddy Rossbach Youth Camp (at Camp Joy in Clarksville, OH) is a six-day, traditional summer camp experience for youth ages 10-17 with limb loss/limb difference. This is a place where kids can just be kids, complete with archery, smores, and arts and crafts. Since 2000, children from all over the country have touched down in Ohio for ‘Amp Camp’. This year’s camp will be from July 8 - July 13. 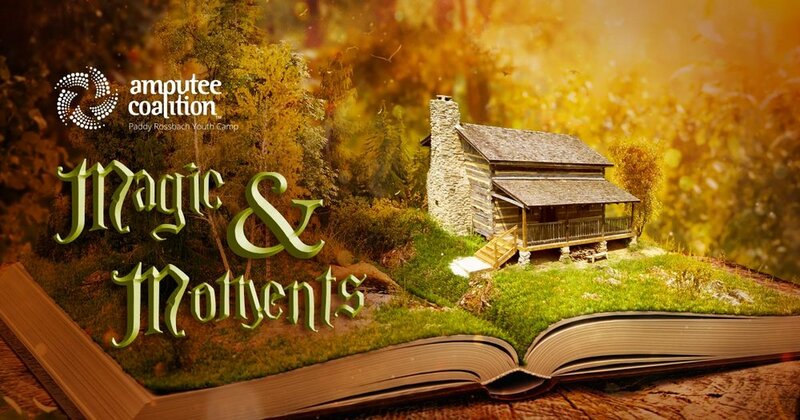 Applications for this year’s camp, Magic& Moments, are now open for campers and counselors. Deadline is 03/01/2019. Please visit https://www.amputee-coalition.org/events-programs/youth-camp/ for more information. You can also email the Amputee Coalition at Camp@amputee-coalition.org or call 1-888-267-5669. Has the cold and unpredictable winter keeping you down? Allow us to brighten your day, registration for the spring session of the Amputee Walking School is open! For those who don't know or haven’t been, Amputee Walking School, is an evening of activity, fun, and community. Staff at UM Rehab and Ortho and Dankmeyer host Todd Schaffhauser and Dennis Oehler as they teach amputees how to increase mobility and find new ways to stay mobile. 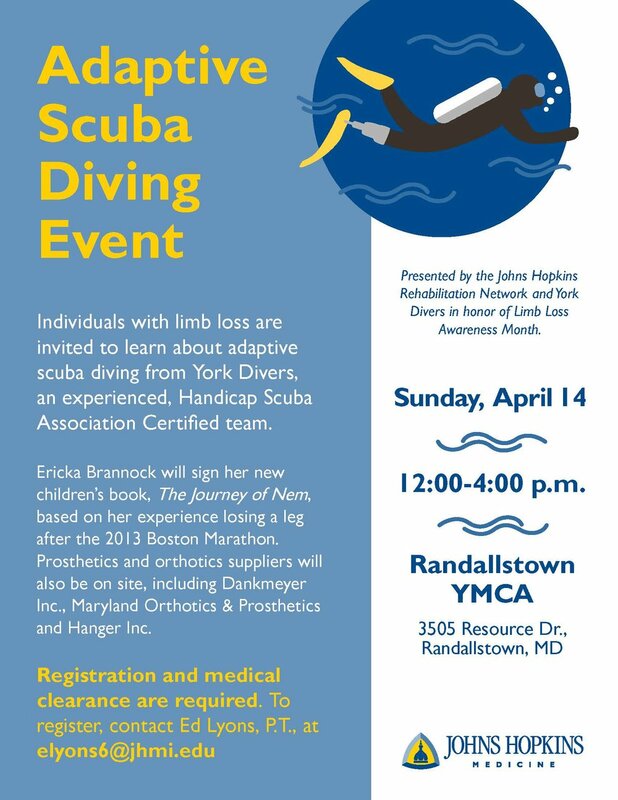 This event is free and geared for those with limb loss, their families and friends, as well as health care professionals who work with those who have had lower extremity amputations. Did we mention, Todd and Dennis are former Paralympic Gold Medalists who have a lot of experience, and great stories to share? If you would like to join us, please register on the Eventbrite page. The Sinai Rehabilitation Center Amputee Support Group will meet on Tuesday, March, 12 from 1:00 pm to 3:00 pm in the 3rd Floor Conference Room of the Michel Mirowski Brain and Spinal Institute Building at the Sinai Hospital. This month the group is asking, what is your K-level and why is it important? If you'd like more information on this topic or have questions about the group, please contact Carol Conrad, PT at (410) 601-0676 or cconrad@lifebridgehealth.org. Can't make it this month? Join them next time, the group meets monthly on the second Tuesday of each month at the same time and location! The Sinai Rehabilitation Center Amputee Support Group will meet on Tuesday, February, 12 from 1:00 pm to 3:00 pm. The group will meet in the 3rd Floor Conference Room of the Michel Mirowski Brain and Spinal Institute Building. This month, Jessica Nusbaum, Individual Assistance Officer, Maryland Emergency Management Agency, will be talking about Emergency Preparedness. No RSVP is needed! If you'd like more information on the group, please contact Carol Conrad, PT at (410) 601-0676 or cconrad@lifebridgehealth.org. If you can't make this meeting, don't worry, the group meets monthly on the second Tuesday of each month at the same time and location! 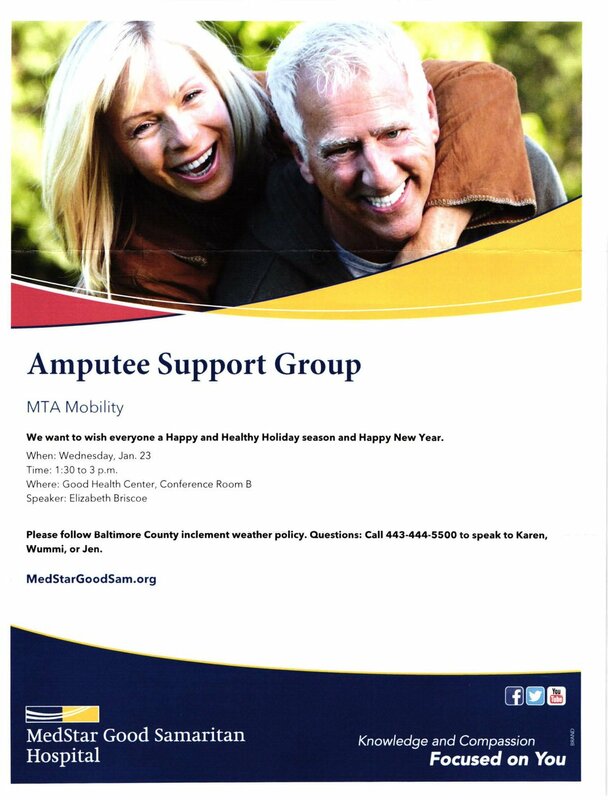 The MedStar Good Samaritan Amputee Support Group will have their next meeting on Wednesday, January, 23, 2019 from 1:30 pm to 3:00 pm. They will be meeting in Conference Room B of the Good Health Center. Elizabeth Briscoe will be speaking about MTA Mobility. Please note that in the event of inclement weather, this group follows the Baltimore County inclement weather policy. The Sinai Rehabilitation Center Amputee Support Group will meet on Tuesday, January 8, 2019 from 1:00 pm to 3:00 pm. The group will meet in the 3rd Floor Conference Room of the Michel Mirowski Brain and Spinal Institute Building. This month, Jan Crye, OT Driving Specialist, will be talking about driving after amputation. The Sinai Rehabilitation Center Amputee Support Group will meet on Tuesday, December 11, 2018 from 1:00 pm to 3:00 pm. The group will meet in the 3rd Floor Conference Room of the Michel Mirowski Brain and Spinal Institute Building. This month, Monica Dorsey-Smith, Dietitian/ Certified Diabetes Educator, will be talking about nutrition. The 2018 Kennedy Krieger Institute’s Festival of Trees, is happening this weekend at the Maryland State Fairgrounds in Timonium! If you are looking for a way to walk off that big holiday dinner or kick off the holiday season, this is the place to be! Dankmeyer happily has had a tree for over five years this year is no exception, the theme is Disney's Winnie the Pooh. 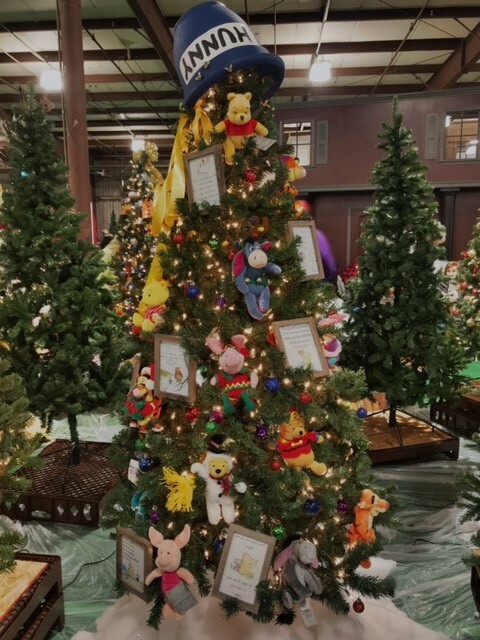 While our elves, Jeanne Smith, Patient Services Representative and Angie Bryl, CPO, Clinical Director didn’t take any photos while making the tree into the 100 Acre Wood, but we have some photos of the finished tree. If you’d like to see the Dankmeyer tree, or any of the other excellent trees, please visit the website for the Festival of Trees at https://festivaloftrees.kennedykrieger.org/ for more information and you can also purchase tickets there. Proceeds from the event support the children of Kennedy Krieger Institute. The last Amputee Walking School of 2018 will be at Dankmeyer on November 14, 2018. Please join us, along with the staff at UM Rehab, Todd Schaffhauser and Dennis Oehler for an evening of fun! If you haven't been before, AWS (Amputee Walking School) is an evening spent with amputees, their friends and family, and members of the medical community that work closely with amputees. Our primary goal is to work on exercises to increase and/or maintain mobility so amputees stay active and have a better quality of life. You can register here: https://dankmeyerwalkingschool.eventbrite.com or call Amy Smith at (410) 636-8114 ext 269. If you have any questions, please call the staff at UM Rehab at (410) 448-6731 or our staff at (410) 636-8114. The November meeting of the Sinai Rehabilitation Center Amputee Support Group will be on Tuesday, November 13, 2018 from 1:00 pm to 3:00 pm. The group meets in the 3rd Floor Conference Room of the Michel Mirowski Brain and Spinal Institute Building. This month, Dr. Scott Brown, will talk about phantom pain. No RSVP is needed. If you'd like more information on the group, please contact Carol Conrad, PT at (410) 601-0676 or cconrad@lifebridgehealth.org. If you can't make this meeting, don't worry, the group will meet monthly on the second Tuesday of each month at the same time and location! The Sinai Rehabilitation Center Amputee Support Group will meet on Tuesday, October 9, 2018 from 1:00 pm to 3:00 pm. The group will meet in the 3rd Floor Conference Room of the Michel Mirowski Brain and Spinal Institute Building. This month, Dr. Julie Karp, Clinical Psychologist, will talk about coping with limb loss. Amputee Walking School is an evening of fun and activity when staff at the University of Maryland Rehabilitation and Orthopaedic Institute (UM Rehab) and Dankmeyer Inc. host Todd Schaffhauser and Dennis Oehler as they teach amputees how to increase mobility or find new ways to stay mobile. This event is free and focused on amputees, their families and friends, as well as health care professionals who work with those who have experienced limb loss. If you would like to join us, please register at Eventbrite. Please be sure to arrive at 4:45 so you don't miss any of the fun! Can you believe that it has been 10 years since the University of Maryland Rehabilitation & Orthopaedic Institute (UM Rehab) started the Adapted Sports Festival? We sure can't! The staff at UM Rehab has been working hard as usual to make the 10th annual event the best one yet! What is an Adapted Sports Festival? UM Rehab's Adapted Sports Festival is an afternoon where people with disabilities can engage in sports in a way that they may not have been able to do before in an commitment free environment. This year you can try: wheelchair basketball, wheelchair rugby, adapted golf, hand cycling, adapted martial arts, wheelchair dance, scuba diving and so much more! There are also demonstrations people can watch and interact with coaches and athletes if you'd like more information. This year, Ann Cody, a Paralympic Gold Medalist, is the keynote speaker. Ann is a member of the Adaptive Sports USA Hall of Fame, a winner of the George M. Steinbrenner III Sport Leadership Awards by the U.S. Olympic Foundation, and a member of the Paralympic Order, which is the highest order of the Paralympic Movement. The event is free for those with disabilities and their families. To register as a participant, please click here and if you'd like to volunteer, please click here. If you are unable to attend but are interested in learning more about UM Rehab's Adaptive Sports Program, please click here. Giddy-up! The Amputee Coalition's 2018 National Conference will be held in Tuscon, AZ! For those living with limb loss or limb difference, this is a great way to meet people who share similar experiences and learn new tricks, tips, take part in hands-on clinics and research, try adaptive activities, and have a lot of fun while doing it! The Amputee Coalition has all the details you need here on their website. The Marriott Starr Pass, site of the 2015 conference, will be hosting again! Early Bird registration is open through June 1. With nearly 100 sessions, there is guaranteed to be something for everyone. Please visit the Amputee Coalition's website for all the details on registration, hotels, preliminary program schedule, FAQ, Certified Peer Visitor Workshop, Support Group Leadership Summit, information on the exhibitors, and what to see in sunny Tuscon, AZ. 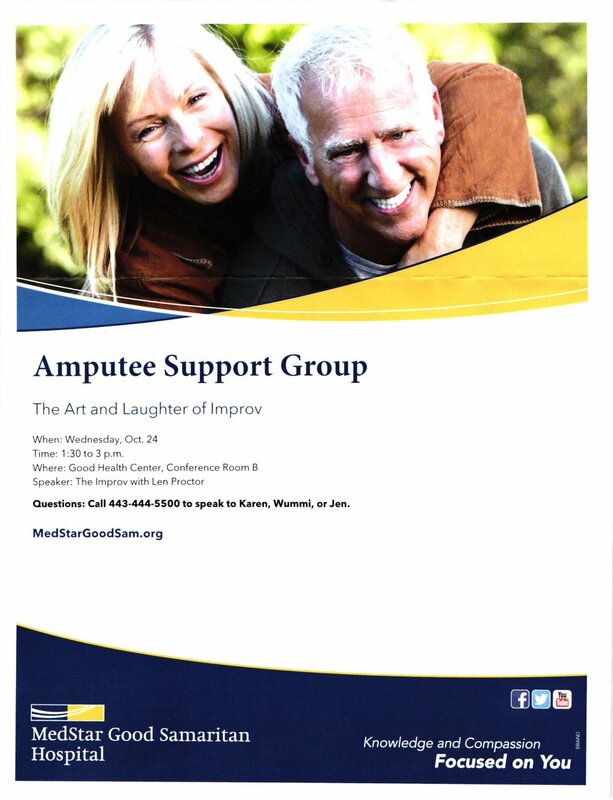 The MedStar Good Samaritan Amputee Support group will have their next meeting on Wednesday, June 27, 2018 from 1:30 pm to 3:00 pm. They will be meeting in Conference Room B of the Good Health Center. Amira Idris of the National Science Foundation will be speaking about alternatives for Phantom Limb Pain Therapy. 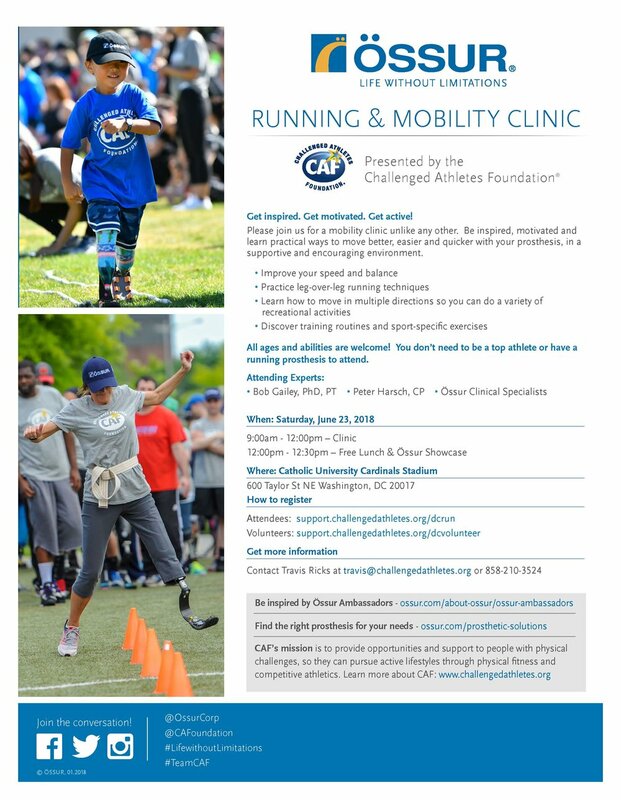 Ossur will be hosting a Running & Mobility Clinic, presented by the Challenged Athletes Foundation, on June 23, 2018 from 9:30 am to 12:30 pm at the Cardinals Stadium at Catholic University in Washington, D.C. The clinic is designed for all ages and abilities and will inspire, motivate, and teach practical ways to improve speed and balance with running exercises, training routines, and other sport specific exercises. You do not need a running prosthesis or be a top athlete to take part, just a desire to improve. Ossur and CAF have openings available for amputees and volunteers, while the event is free, you must register in advance. Amputees can register by clicking here. Volunteers can register by clicking here. If you would like more information, you can call Travis Ricks at (858) 210-3524 or email him at travis@challengedathletes.org, or you can visit the website. Update: Erika Brannock will be at AWS to sign her new children’s book, The Journey of NEM! NEM is based on the true story of her experiences after the 2013 Boston Marathon,when she became an amputee. This motivational speaker and preschool teacher writes, “I wrote this book hoping to help children understand that when a hard thing happens to them, it’s not going to defeat them…”. Erika cannot wait to share this beautifully illustrated tale, and the Dankmeyer team is very happy to be a part of her continuing journey. Amputee Walking School is an evening of fun and activity when staff at the University of Maryland Rehabilitation and Orthopaedic Institute (UMROI) and Dankmeyer Inc. host Todd Schaffhauser and Dennis Oehler as they teach amputees how to increase mobility or find new ways to stay mobile. If you would like to join us, please register at Eventbrite. Please be sure to arrive at 4:45 to check in so you don't miss any of the fun! There is a new support group coming to the Sinai Hospital! 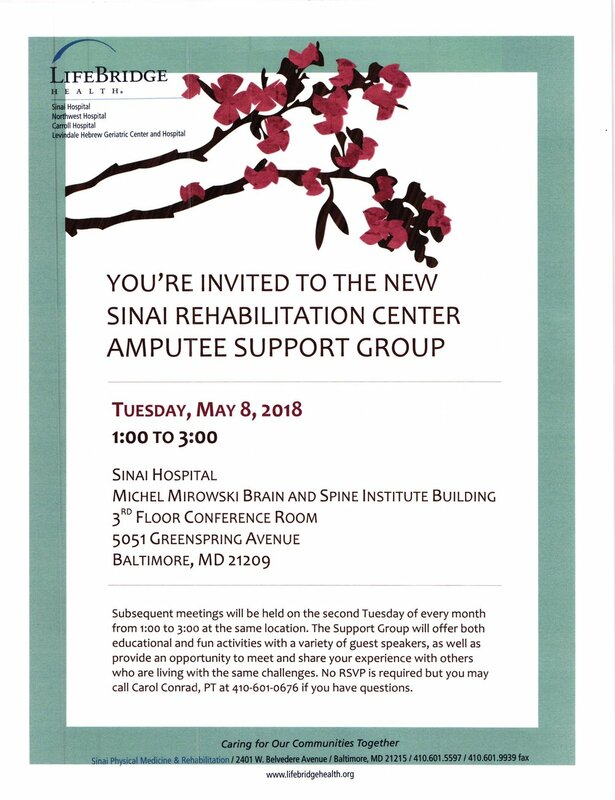 The kickoff meeting for the Sinai Rehabilitation Center Amputee Support Group will be held on Tuesday, May 8, 2018 from 1:00 pm to 3:00 pm. The group will meet in the 3rd Floor Conference Room of the Michel Mirowski Brain and Spinal Institute Building. The group plans to focus on the day to day issues and struggles of amputees and will provide information and guidance by hosting a variety of speakers who have knowledge and experience to help. This will also allow amputees to meet others and share experiences. No RSVP is needed. 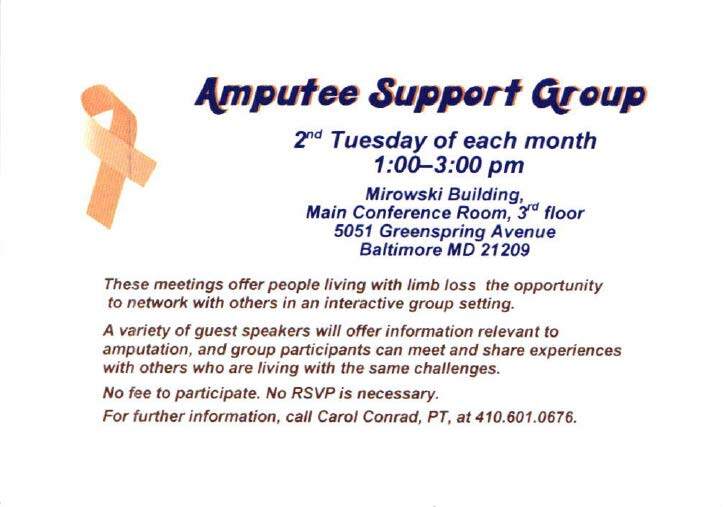 If you'd like more information on the group, please contact Carol Conrad, PT at (410) 601-0676. Left to Right, Kelsey Kasten, CPO; Nina Bondre, CPO; Dr. Andrew Rubin; Rob Tyler, CP, Board Eligible Orthotist enjoying themselves at the event in 2017. It's time for the 3rd Annual Amputee Awareness 5K Walk, Wheel or Run! Registration is free and open to anyone. However, you are able to make contributions to support the Amputee Patient Assistance Fund. The event is rain or shine, but should severe weather occur, an email will be sent to anyone who is registered. Are you counting down the days till spring? Well, get started on your spring planning and register for the Spring session of the Amputee Walking School! 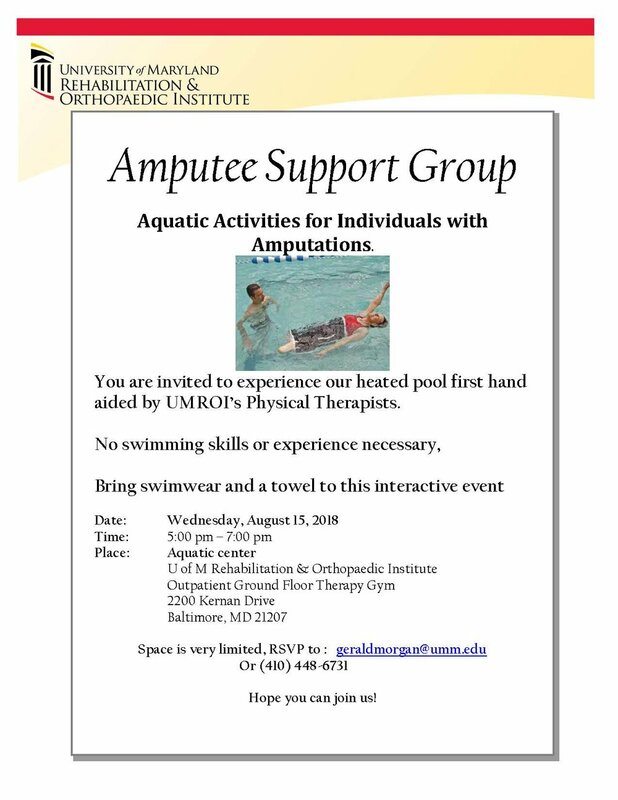 For those who don't know, Amputee Walking School, is an evening of fun and activity when staff at University of Maryland Rehabilitation and Orthopaedic Institute (UMROI), Dankmeyer host Todd Schaffhauser and Dennis Oehler as they teach amputees how in increase mobility or find new ways to stay mobile. This event is free and geared for amputees, their families and friends, as well as health care professionals who work with those who have had amputations.